There are two types of transmission: automatic and manual. 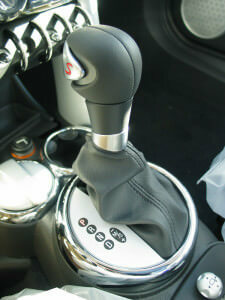 In an automatic car, there is no gear shift or clutch pedal. As the name suggestions, the process of gear changing is done without any need for user input. The transmission is a very complex system that handles the engine’s power through to the driveshaft. Due to the fact that it’s made up of many moving mechanical parts that all interact with each other, it produces a lot of friction and thus general wear and tear. The transmission is one of the most expensive things to get repaired. As such, it’s important to be aware of any signs that the transmission in the Mini Cooper is failing. Adhering to the Inspection 1 and 2 schedules as outlined by Mini will ensure that your transmission lasts longer, but you should still be aware of transmission failure symptoms so that you can rectify them early. Leaking fluid: automatic transmission fluid allows the entire system to run and it’ll cease to operate without it – if it’s leaking then there’s a problem, especially if it’s coloured dark. One way of helping maintaining your transmission is to flush the system. This process removes all of the transmission oil by running a combination of new oil and cleaning solutions through. This then pushes out the sludge that has mounted inside. If the fluid comes out black, this is a sign of a bad transmission as it should be red and clear by standard. If this is the case, you need to have your transmission inspected. Note that this is a preventative maintenance process and will not resolve any problems you’re having. German Car Depot will be able to check your transmission to ensure the system’s health and also repair any problems you might be having. We can offer prices that are cheaper than dealerships, but can still offer the great level of service that you’d expect.